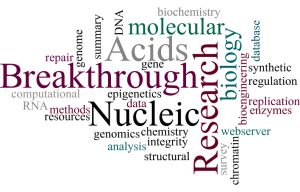 NAR’s Breakthrough Articles present high-impact studies answering long-standing questions in the field of nucleic acids research and/or opening up new areas and mechanistic hypotheses for investigation. These articles are chosen by the Editors on the recommendation of Editorial Board Members and Referees. Articles are accompanied by a brief synopsis explaining the findings of the paper and where they fit in the broader context of nucleic acids research. They represent the very best papers published at NAR. It is essential for cell survival that DNA damage response proteins rapidly mobilize to DNA lesions. Importantly, these proteins must also be excluded from binding to undamaged chromatin. The mechanism of this exclusion is a long-standing question. This study by Vidi and coworkers demonstrates that DNA damage increases the diffusion speed of 53BP1, a key factor that binds to DNA double-strand breaks and regulates their repair. This increased diffusion speed results from reversal of sequestration by NuMA, a structural protein in the cell nucleus. This mechanism of reversible sequestration, which may extend to other DNA damage response and repair proteins, likely impacts the response to agents used in cancer treatment as well as physiological DNA repair in cells of the immune system. As predicted from the authors’ model, NuMA expression levels have prognostic value for breast cancer patients. The VMH integrates the metabolic reconstructions of human (Recon3D) and gut microbes (AGORA) representing a vast and unique knowledge base for metabolic pathways. Both resources have a shared nomenclature which allows exploring potential interactions between gut microbes and host metabolism. These reconstructions can also be used for metabolic modeling experiments. The VMH functions as a knowledge hub. It interlinks “Human metabolism”, “Gut microbiome”, “Disease”, “Nutrition”, and “ReconMaps”, allowing for cross-linked analysis. Emphasis has been placed on connecting VMH’s entities with external resources facilitating access to further metabolic, genetic, clinical, nutritional, and toxicological information. The VMH enables the visualization of simulation and experimental data in the context of the human metabolic network. Seven comprehensive Google-like maps of human metabolism are available in the “ReconMaps” resource. Understanding anatomical structures and biological functions based on gene expression is critical in a systemic approach to address the complexity of the mammalian brain. Co-expressed genes are thought to regulate cell type- or region-specific brain functions. Thus, well-designed data acquisition and visualization systems for profiling combinatorial gene expression in relation to anatomical structures are crucial. The authors have mapped spatial expression densities of genome-wide transcripts to the 3D coordinates of mouse brains at four post-natal stages, and built a database, ViBrism DB. With the DB platform, users can access a total of 172 022 expression maps of transcripts in the whole context of 3D magnetic resonance (MR) images. Co-expression of transcripts is represented in the image space and in topological network graphs. In situ hybridization images and anatomical area maps are browsable in the same space of 3D expression maps using a new browser-based 2D/3D viewer.